Wall Control 30-GS-0332 GV Metal Strip Galvanized Pegboard Rails, 32"
The Wall Control Pegboard Screwdriver Holder Bracket Slotted Metal Pegboard Accessory for Wall Control's Pegboard and Slotted Tool Board is a pegboard accessory for not only Screwdrivers but other similar items such as holding T-Handled Allen Wrenches on pegboard. The pegboard screwdriver holder is also great on craft and hobby pegboard for storing watercolor pain brushes on pegboard. The Wall Control screwdriver holder for pegboard features holes for 6 screwdrivers or similarly shaped items. 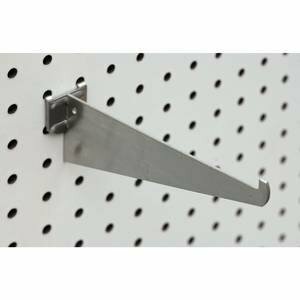 Wall Control Slotted Metal Pegboard Hooks and Supplies feature a scratch and rust resistant baked-on finish. These more secure and stable tool board accessories are for use with the slots found in all Wall Control Metal Pegboard tool board panels only. Wall Control Slotted Tool board accessories offer a patented engagement that requires two deliberate motions up-and-down to engage and disengage the hooks. This feature makes Wall Control Slotted Pegboard accessories less likely to fall out of the tool board than conventional peg hooks that can easily fall off when tools are removed. Although Wall Control Metal Pegboard Panels will accept conventional 1/4in pegboard accessories as well as Wall Control Slotted Accessories the Slotted Secure Tool Board Hooks included in this set are only for use with Wall Control Metal Pegboard Panels and Tool Boards. 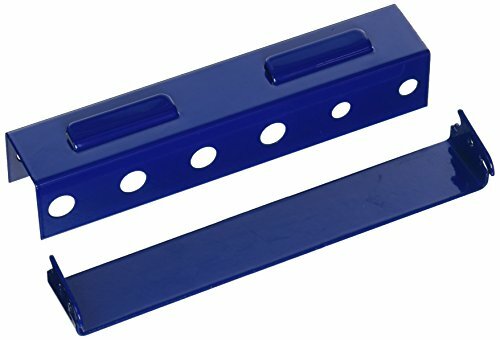 Wall Control Pegboard Products are Made in the USA (1) Blue Slotted Metal Pegboard Screwdriver Holder Bracket Assembly Included Only for use with Wall Control Pegboard and Slotted Tool Board Panels. Peg Board Hooks Tool holder designed to cut out to fit your tools and crafts perferctly. Pegboard Multi purpose Tool Holder. Simply cut the ring with razor knife to size you need to hang Many different Tools and Items. Look at the pictures and you would be amazed how versatile these are compared to our competitors. 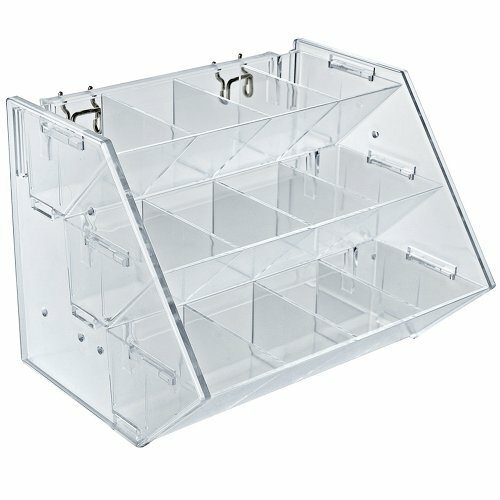 Perfect for Crafts, tools and shop/garage organization. 50 Pack Inside Diameter of First hole 1/4 inch Inside Diameter of Second hole 1/2 inch Inside Diameter of Third hole 3/4 inch These are much Better than the other ones you see advertised on eBay (SPRING STYLE) and amazon which will break and crack over time. Our design is engineered so that you can get the most out of the space that you have on your peg board. You simply cut out the hole to fit whatever you are trying to hold. If you look at the pictures above you can see the wide variety of things you can do with our quality multipurpose tool holder. 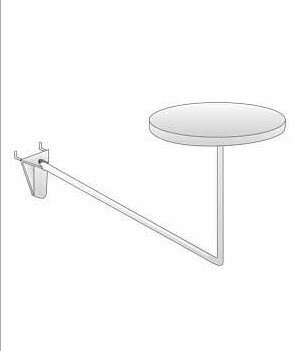 MADE IN THE USA Details Brand: JSP Color: White Manufacturer: JSP Size: Standard 1/4"(where it mounts to the pegboard) Bulk order discounts are available, please contact us for pricing for bulk orders. We also sell a kit on amazon that includes 25 J hooks and 25 L hooks and 20 tool holders and 1 large Plastic bin search on amazon for B00V7ECYJS or search for 71 pc Peg Hook Kit We also sell a 30 piece kit on amazon search for pc B00UKFNVXS or search for Peg Hook Kit 30. BOTH KITS ARE ON SALE UNTIL 30 MAY and are 35% off. Pegboard Multi purpose Tool Holder. Simply cut the ring with razor knife to size you need to hang Many different Tools and Items. The Wall Control Pegboard Screwdriver Holder Bracket Slotted Metal Pegboard Accessory for Wall Control's Pegboard and Slotted Tool Board is a pegboard accessory for not only Screwdrivers but other similar items such as holding T-Handled Allen Wrenches on pegboard. The pegboard screwdriver holder is also great on craft and hobby pegboard for storing watercolor pain brushes on pegboard. The Wall Control screwdriver holder for pegboard features holes for 6 screwdrivers or similarly shaped items. 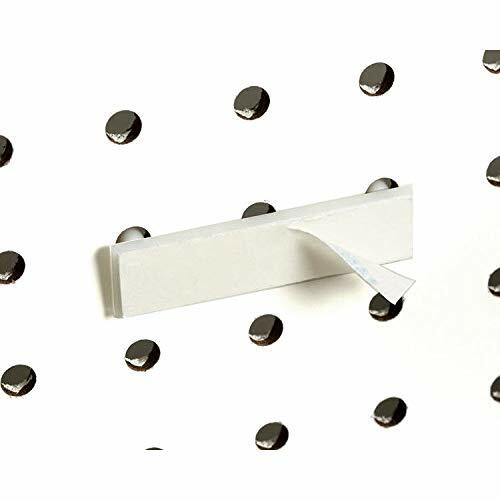 Wall Control Slotted Metal Pegboard Hooks and Supplies feature a scratch and rust resistant baked-on finish. These more secure and stable tool board accessories are for use with the slots found in all Wall Control Metal Pegboard tool board panels only. Wall Control Slotted Tool board accessories offer a patented engagement that requires two deliberate motions up-and-down to engage and disengage the hooks. This feature makes Wall Control Slotted Pegboard accessories less likely to fall out of the tool board than conventional peg hooks that can easily fall off when tools are removed. Although Wall Control Metal Pegboard Panels will accept conventional 1/4in pegboard accessories as well as Wall Control Slotted Accessories the Slotted Secure Tool Board Hooks included in this set are only for use with Wall Control Metal Pegboard Panels and Tool Boards. Wall Control Pegboard Products are Made in the USA (1) White Slotted Metal Pegboard Screwdriver Holder Bracket Assembly Included Only for use with Wall Control Pegboard and Slotted Tool Board Panels. The Wall Control Pegboard Screwdriver Holder Bracket Slotted Metal Pegboard Accessory for Wall Control's Pegboard and Slotted Tool Board is a pegboard accessory for not only Screwdrivers but other similar items such as holding T-Handled Allen Wrenches on pegboard. The pegboard screwdriver holder is also great on craft and hobby pegboard for storing watercolor pain brushes on pegboard. The Wall Control screwdriver holder for pegboard features holes for 6 screwdrivers or similarly shaped items. Wall Control Slotted Metal Pegboard Hooks and Supplies feature a scratch and rust resistant baked-on finish. These more secure and stable tool board accessories are for use with the slots found in all Wall Control Metal Pegboard tool board panels only. Wall Control Slotted Tool board accessories offer a patented engagement that requires two deliberate motions up-and-down to engage and disengage the hooks. This feature makes Wall Control Slotted Pegboard accessories less likely to fall out of the tool board than conventional peg hooks that can easily fall off when tools are removed. Although Wall Control Metal Pegboard Panels will accept conventional 1/4in pegboard accessories as well as Wall Control Slotted Accessories the Slotted Secure Tool Board Hooks included in this set are only for use with Wall Control Metal Pegboard Panels and Tool Boards. 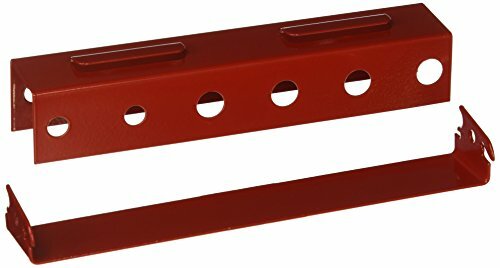 Wall Control Pegboard Products are Made in the USA (1) Red Slotted Metal Pegboard Screwdriver Holder Bracket Assembly Included Only for use with Wall Control Pegboard and Slotted Tool Board Panels. 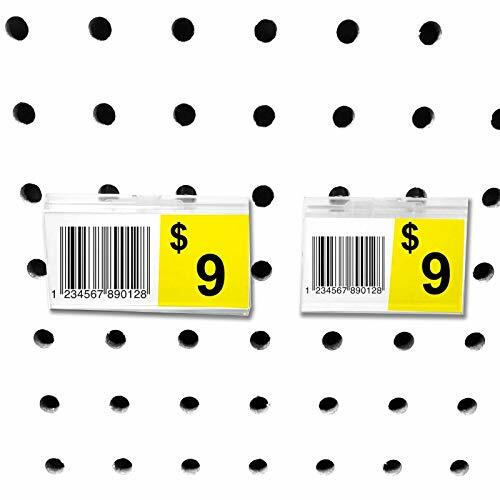 Insert our scannable UPC / Price Ticket holders into your pegboard to easily display product information on your peg wall. 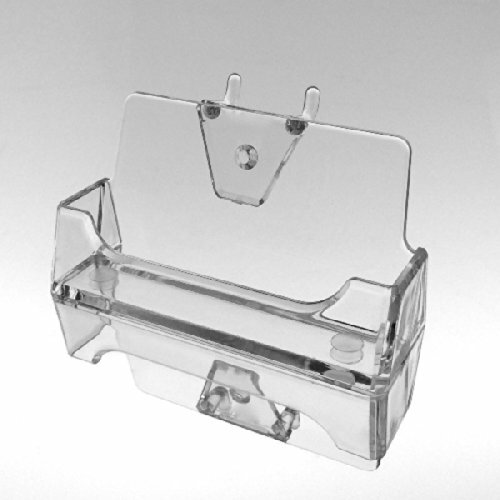 These label holders are made out of a clear plastic. They include a slot where you can easily slide in a ticket & protect your product information while still keeping the price visible. This item comes in two parts, the flip scan label holder & an adapter so you can easily place the tag onto your pegboard. 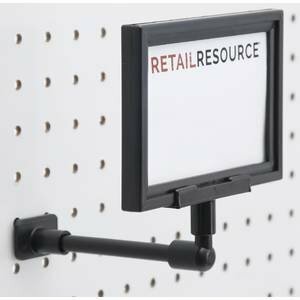 This item is perfect for retail applications such as convenience stores, gift shops, hardware stores and works great in the garage to neatly label your pegboard setup. This listing is for 100 scanner plates & 100 Scan Tag Adapters. Each scanner plate measures 2.5 L x 1.25 H.
Metal Pegboard Strips by Wall Control Storage Systems offer great wall storage for a great value. This pack of two 16in wide by 2.5in high pegboard strips can be mounted side by side or individually in different locations. The pegboard strips are great for confined space tool storage and accept Wall Control slotted single-row engaging pegboard accessories as well as conventional 1/4in pegboard hooks. Pack Includes: (2) 16in x 2.5in Galvanized Pegboard Strips. Made in The USA. The Wall Control Pegboard Screwdriver Holder Bracket Slotted Metal Pegboard Accessory for Wall Control's Pegboard and Slotted Tool Board is a pegboard accessory for not only Screwdrivers but other similar items such as holding T-Handled Allen Wrenches on pegboard. The pegboard screwdriver holder is also great on craft and hobby pegboard for storing watercolor pain brushes on pegboard. 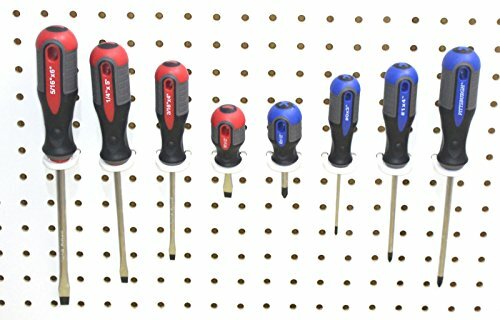 The Wall Control screwdriver holder for pegboard features holes for 6 screwdrivers or similarly shaped items. Wall Control Slotted Metal Pegboard Hooks and Supplies feature a scratch and rust resistant baked-on finish. These more secure and stable tool board accessories are for use with the slots found in all Wall Control Metal Pegboard tool board panels only. Wall Control Slotted Toolboard accessories offer a patented engagement that requires two deliberate motions up-and-down to engage and disengage the hooks. This feature makes Wall Control Slotted Pegboard accessories less likely to fall out of the tool board than conventional peg hooks that can easily fall off when tools are removed. Although Wall Control Metal Pegboard Panels will accept conventional 1/4in pegboard accessories as well as Wall Control Slotted Accessories the Slotted Secure Tool Board Hooks included in this set are only for use with Wall Control Metal Pegboard Panels and Tool Boards. Wall Control Pegboard Products are Made in the USA (1) Black Slotted Metal Pegboard Screwdriver Holder Bracket Assembly Included Only for use with Wall Control Pegboard and Slotted Tool Board Panels. Used to hold a single hat or cap. Should be used with a foam pad (FPMC). Can also be used for sporting good accessories. 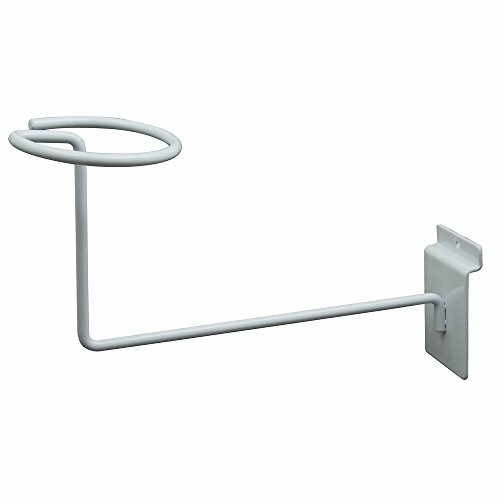 Displayer stands 8" from Slat wall Panel. Black Multi-Mount Hat/Ball Display, 5"
This versatile hat/ball display features a multi-mount design that will fit slatwall, gridwall and pegboard! Constructed of steel wire with a black finish. The 5" (dia) ring on this hat/ball display will hold caps, helmets, basketballs, soccer balls and more. Perfect for cross merchandising sports apparel and equipment. This pegboard shelf bracket will sell merchandise. The hardware is ideal for creating appealing displays. The pegboard shelf bracket allow for displays to accommodate a variety of products. The hardware is great for creating an upscale appearance. This pegboard shelf bracket will make displays look organized to neatly present merchandise. Primarily used for hanging merchandise, gives retailer the ability to include more inventory on the selling floor. Black styrene sign frame can be configured vertically or horizontally. It has a top loading slot which accepts material up to an 1/8" thick and has a 4" extension so it stands out from the board. This sign frame fits any standard pegboard. Use our Pegboard & Slatwall plastic plate adapter to add a slatwall or pegboard backing to an item that does not have it. 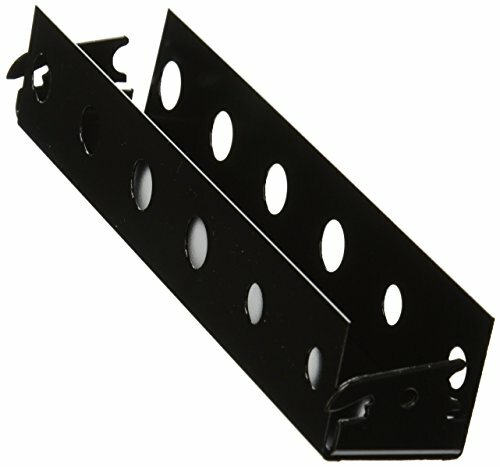 It features two peg prongs that fit right into most slatwall panels & pegboard holes. 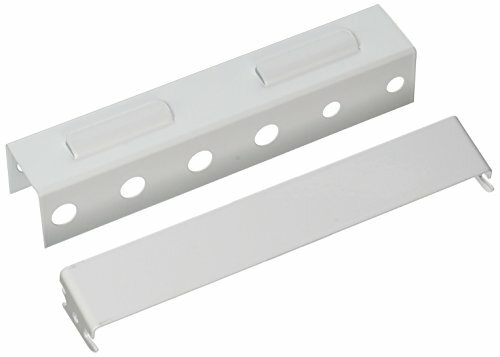 This peg & slat back plate converter is white and made out of plastic. It has a very strong adhesive strip on the back so you can easily so you can easily attach it to the item you'd like to mount. 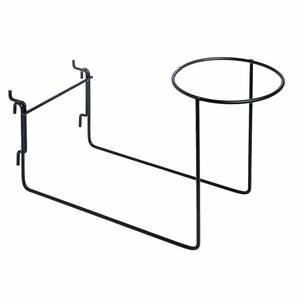 Perfect for attaching signs, pockets or literature holders and making them compatible with slat wall or peg board panes with 1/4 diameter holes. Once attached items will sit flush against your panel. There is no weight rating available, the strength of the adapter depends on the surface you stick it to & the strength of your display panel. We recommend displaying products weighing from 7-10 lb. The plate measures 2.4 L x .63 H. The entire height of the adapter (including the prongs) .83 H. 10 Units per order. If you have pegboard, add this lot of 3 single hat display racks each with grey foam cover for organizing or displaying hats on. Fits 1/8in or 1/4in pegboard holes. Foam padding adds protection to display stands! 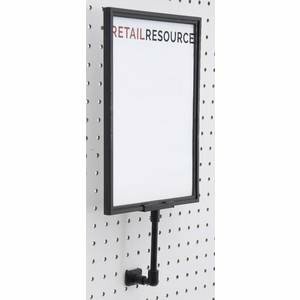 This Acrylic is a handy Literature Pegboard Display system, made especially to increase your visibility within your busy office location and a return on your investment. Overall Dimensions: 3 3/4" x 2" x 3/4"
Designed for standard sized business cards.